Irwin Vise-Grip 10WR Fast Release Locking Plier with curved jaws that allow for maximum contact for all work shapes, inculding round pipes, squares, or hex bolts. Length: 250mm (10 inch), Capacity: 48mm. Irwin Vise-grip 6LN Fast Release long nose locking plier with their long tapered nose are perfect for delicate work, hobbies, tight spaces, electronics and clamping of small parts. Length: 150mm (6 inch), Capacity 51mm. 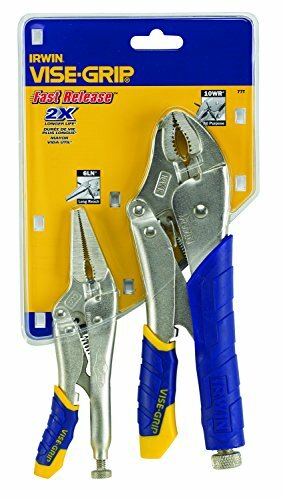 Both pliers have self-energising lower jaw that allows for three times more gripping power and lasts twice as long as the high grade alloy steel is heat treated for maxmium durabilty. ProTouch grips provide more control, comfort and less hand fatigue. The hex key adjusting screw tightens to draw materials closer together and also provides controlled release. They also have a built-in wire cutter.